Flaxseed, which comes from the flax plant, has a history of medicinal use dating to ancient Egypt. Flaxseed contains omega-3 fatty acids, which might reduce cholesterol levels, lower blood pressure, decrease inflammation and improve irregular heartbeats. Like other omega-3 fatty acids that can reduce the risk of heart disease, flaxseed might act as a blood thinner by interfering with platelets' ability to stick together. Blood clots form when platelets -- small, irregularly shaped, colorless cells produced in the bone marrow -- congregate at the site of an injury, plugging the break and stopping bleeding. 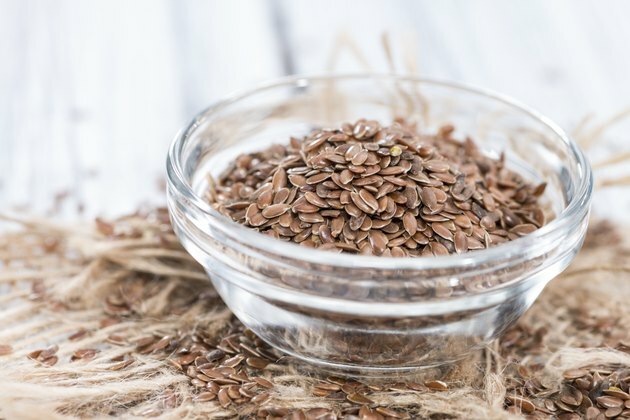 Flaxseed contains the omega-3 fatty acid alpha-linolenic acid, which converts, although inefficiently, to eicosapentaenoic acid, or EPA, and docosahexaenoic acid, also known as DHA, the omega-3 fatty acids that give fish its heart-health benefits. Flaxseed, like other omega-3 fatty acids, makes platelets less "sticky" so that they can't form large clots. Reducing platelet aggregation decreases the chance that blood clots will form at atherosclerotic sites. Atherosclerosis -- plaque formation inside the blood vessels -- develops when low-density lipoprotein, the "bad" form of cholesterol, along with other cellular debris attach to blood vessel walls. Injury to the walls brings platelets to the site to repair the damage. Platelet aggregation can narrow the blood vessels, making it difficult for blood to reach the heart. Large clots also can break off and lodge in the brain, causing stroke. Prescription blood thinning medications also can reduce aggregation. Researchers from the University of Sydney conducted a small study on the effects of flaxseed on platelet aggregation and published the results in the March 1995 issue of the "European Journal of Clinical Nutrition." Subjects consumed either 40 g of flaxseed oil or sunflower oil for 23 days. At the end of the study, platelet EPA levels more than doubled in subjects taking flaxseed oil but did not change in those taking sunflower oil. Researchers concluded that flaxseed oil has benefits in reducing platelet aggregation. If you take prescription blood thinners, it's possible that taking flaxseed could increase your risk of bleeding excessively. Your doctor might suggest stopping flaxseed before scheduled surgery. Report abnormal bruising, injuries that won't stop bleeding, vomiting blood or dark, tarry stools to your medical practitioner. Can Fish Oil Reverse Plaque in Arteries?